When you decided that Custom RTMP is the option for you simply chose the plan which fit your needs from here. Notice: Facebook being far most requested platforms to add into our list, but for now, it is only available in the form of Custom RTMP. Learn how to connect Facebook here. For each custom platform, you need 1 Custom RTMP, that means that for 3 Facebook channels you will requires our Professional plan as it includes 3 Custom RTMP channels. IMPORTANT! Doubling option cannot be applied on Custom RTMP! 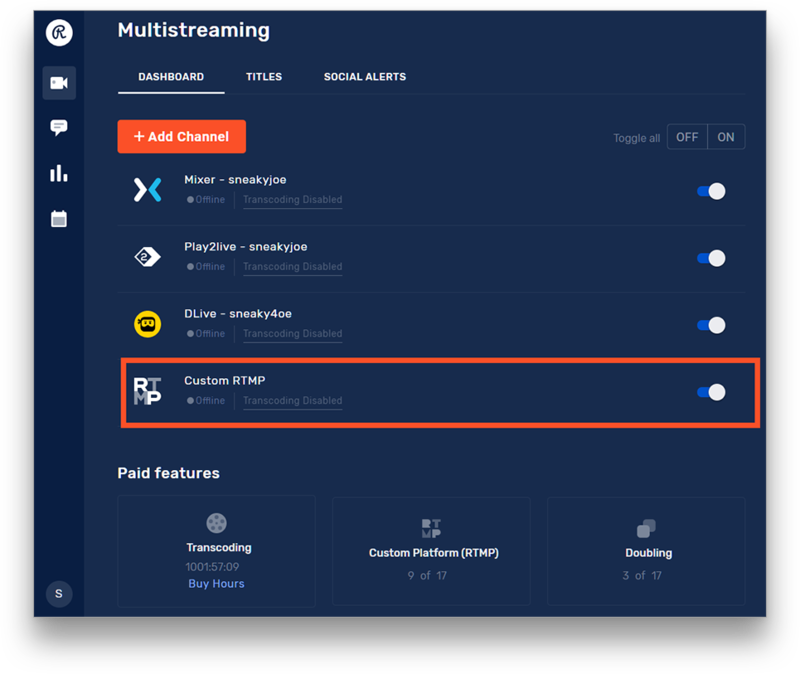 After you purchase a plan which includes number of Custom RTMP channels, it allows you to have available slots to add Custom channels, which you can see in the description of your RTMP below the connected platforms, how many slots you have and how many you have used. How to add Custom RTMP? 1. 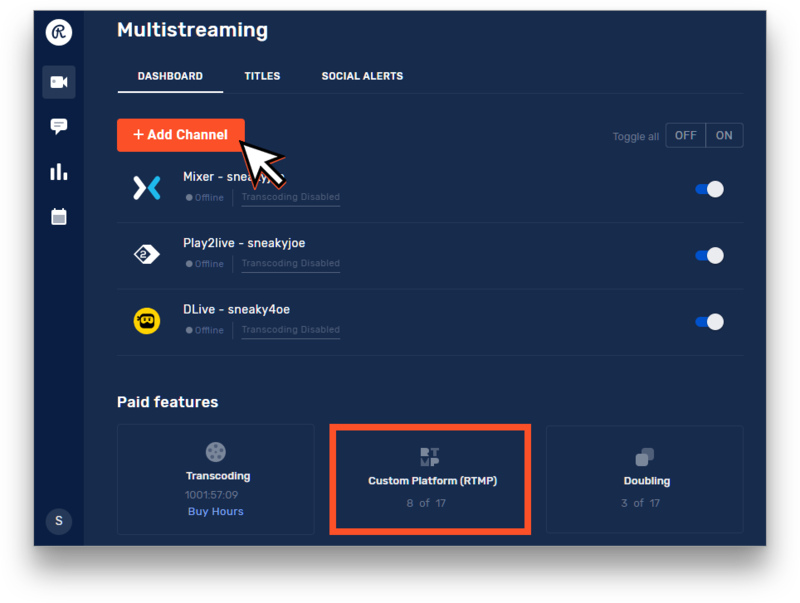 Simply click on "Add channel" button and proceed to the end of platforms list. 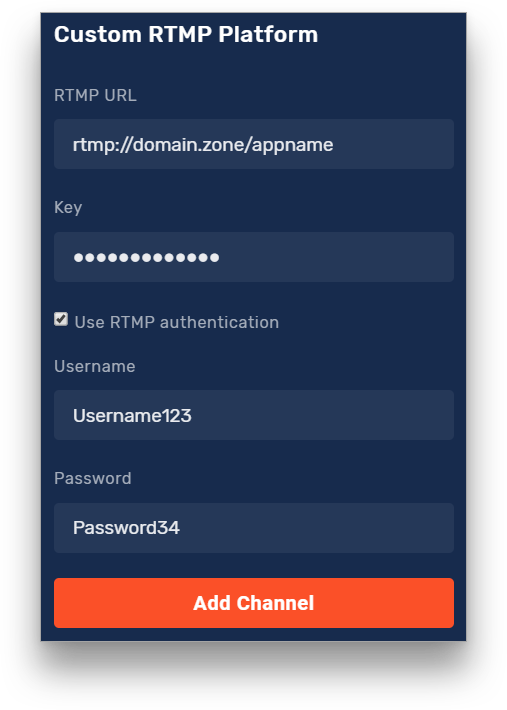 Chose "Custom Platform (RTMP)" option. You will be asked to purchase it if you have not done it already. 2. 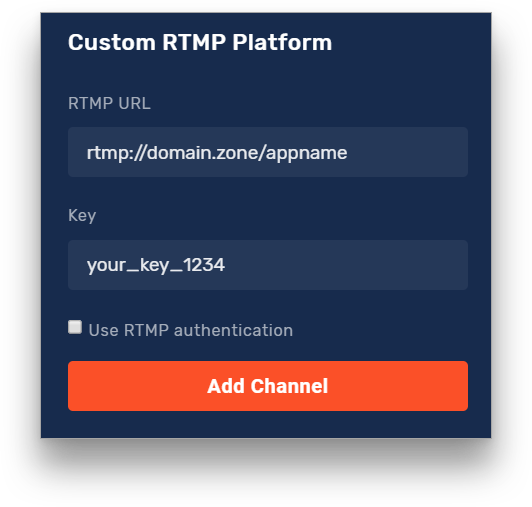 Fill in your custom RTMP URL and Stream Key provided by the platform you connecting and click "Add channel"
If you need, you can use RTMP Authentication with your username and password, but normally this is not necessary. 3. 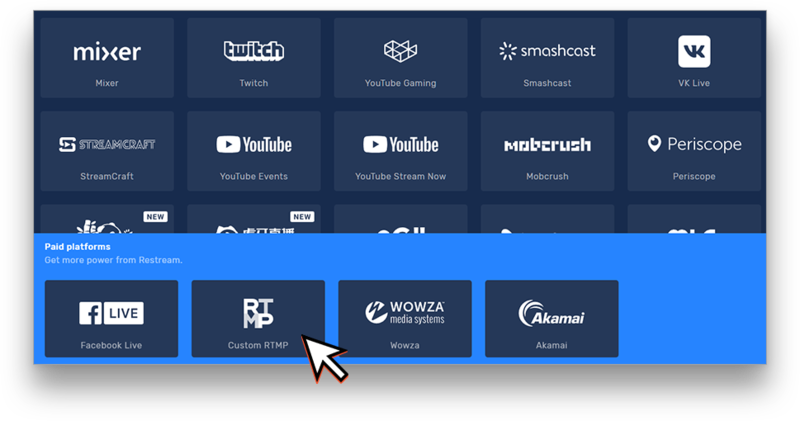 Your custom RTMP will be added to the list of your current connected platforms. Please keep in mind, that a Custom RTMP platform will not always be unable to receive status information. While most channels will show "Online/Offline" or "Connecting.." a Custom RTMP platform may show "Statuses for this platform are not supported" this isn't an error and can't be fixed, but it still should display proper statuses for most of the custom services. Tip: Make sure to check our Supported Services article.